A profoundly considered, lyrically wrought, refreshingly hands-on survey of the disappearing frontier in America’s wildest state. This debut won the inaugural Chinook Literary Prize, dedicated to literature about the Pacific Northwest. Simpson (Journalism/Univ. 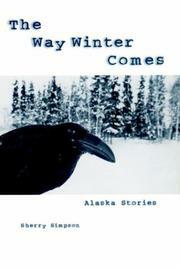 of Alaska), a two-time contributor to the Sierra Club’s Best American Nature Writing anthology, turns a poet’s eye on the wild Alaska she obviously cherishes. But it’s her objectivity and intellectual curiosity that distinguish the eight pieces, which mix personal essays with reportage. Simpson spends a week alone on uninhabited Lincoln Island (“On the Island of Desire”) and in the title essay journeys to Barrow to meet the coming winter at the high Arctic edge of the continent. Being lost-or more precisely, “wishing for what is lost to us”—has obsessed her since she wrote her first story about a shipwrecked band of children at the age of ten. Simpson’s essays capture “the places where event and myth and legend rub together” and she smartly analyzes how myth and science effect our understanding (and misunderstanding) of wild animals. When not exploring her own connection to the land, she accompanies wildlife biologists as they tag bears threatened by massive clear-cut logging in Tongass National Forest, use radio telemetry to track the ubiquitous moose, and cruise alleys behind fast-food restaurants to puzzle over the behavioral eccentricities of ravens. The opening essay, “Killing Wolves,” is the most divisive and-in its graphic description of the grim business of wolf trapping-hardest to read. Examining the reality behind political battles over wolves in Alaska, Simpson attends a training school for trappers. She’s steadfastly objective, refusing to condemn the men, but they come off as selfish, intellectually dishonest solipsists who call wolves reckless killers to justify their own killing trade. A striking debut that should raise serious questions about the future of the Alaskan wilderness.